Pipe bowls found in the East field at Paces Paines.One early colonist who took advantage of the new Virginia Company policies was Richard Pace, who came to Virginia with his wife Isabell sometime before 1616. Initially, the Paces, who as “ancient planters” in Virginia prior to 1616 and thus eligible for a dividend of 100 acres per person, were granted 200 acres of land along the southside of the James River. Although the Paces Paines plantation lasted little more than a decade before it was subsumed into the larger Swann’s Point plantation, Richard Pace and Chanco, an Indian servant living at Paces Paines, had an everlasting effect on the course of American history for their roles in the Uprising of 1622. Pipe bowls found in the East field at Paces Paines. 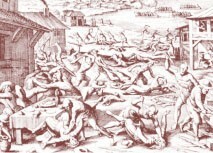 Virginia Indian Massacre of 1622 – Gottfried. Pace vpon this discouery, securing his house, before day rowed ouer the Riuer to James City (in that place neere three miles in bredth) and gaaue notice thereof to the Gouernor, by which meanes they were preuented there, and at such other Plantations as possible for a timely intelligence to be giuen. A 1625 muster of the Virginia colony indicates that here were four separate households at Paces Paines. The archaeological survey of Mount Pleasant has discovered one of the four Paces Paines’ sites in the downriver or east field. The artifacts collected from the site are the same types that have been excavated at Martin’s Hundred including clay tobacco pipe bowls (one with markings identical to a pipe from Wolstenholme Town), fragments of Rhenish stoneware Bartmann or “bearded man” jugs, Iberian costrel sherds, and pieces of Staffordshire butterpot. In 1635, William Swann patented 1200 acres that included the Paces Paines tract. Thomas Swann I inherited the plantation in 1638, which then descended in 1680 to Samuel Swann. Thomas and Samuel both had their homes across “Mount Swamp” on the eastern half of the property along Gray’s Creek. The seventeenth-century Swann house site, which has been archaeologically tested, is not far from the Swann family cemetery. The south field at Mount Pleasant contains a large archaeological site that apparently originated sometime in the late seventeenth century during the Swann era. The only test excavation in the site revealed a twelve-foot wide chimney base for a frame building. The chimney base has a significant northeast-southwest orientation, unlike the true north-south orientation of the present dwelling at Mount Pleasant. It is conceivable that this site marks the dwelling that stood prior to the construction of Mount Pleasant, and perhaps the home of John Hartwell.